Once you have decided on the walling you would like, you also need to pay attention to the type of gate to complete your security installation. You can have plain steel gates or gates with doggie bars. These are important to keep your fur babies safe inside your property. Our sliding gates are made to suit our clients, and are installed with high quality gate tracks. The gate tracks are important to ensure the gate moves smoothly, and does not put any stress on the gate motor, thus prolonging the gate motor life. Anti-lift brackets ensure the gate cannot be lifted off the track to obtain easy access to your property, ensuring added security. At Country Wide Walling we believe in supplying our customers with a fully tailored package, and take pride in delivering outstanding workmanship and products. Whether it is a sliding gate or a swing gate that you require, we can and will deliver and install together with your walling, to ensure you have the full security you require. 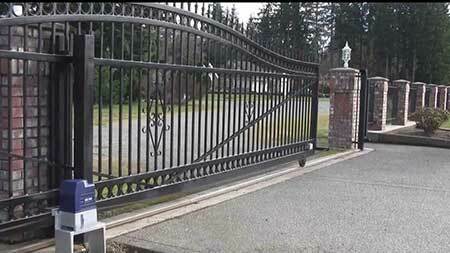 Steel gates can be made with fancy patterns as well as plain, to suite individual needs. Our walls and gates will give added value to your property, and are both aesthetically pleasing as well as a practical solution to securing your property. Spikes or spears can be added to the centre or top of the gate to make it difficult and painful for anyone wishing to intrude on your property. 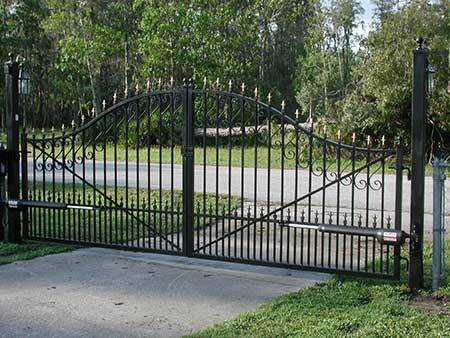 Steel is definitely the best option for gates as they are not as easy to cut through as a wooden gate would be, should someone try to get through to your house or garage. Why not contact us today to discuss what is best for you to keep your family and property safe, or to request a free quotation. Our consultants will gladly assist you.